Still Life With Cake (1818), a typical still life by Raphaelle Peale (1774 – 1825), the son of Charles Willson Peale, may have been the picture exhibited in 1819 at the Pennsylvania Academy of the Fine Arts as Still Life—Wine, Cakes, Grapes, &c. A similar picture dating from the same year is in the Detroit Institute of Arts. 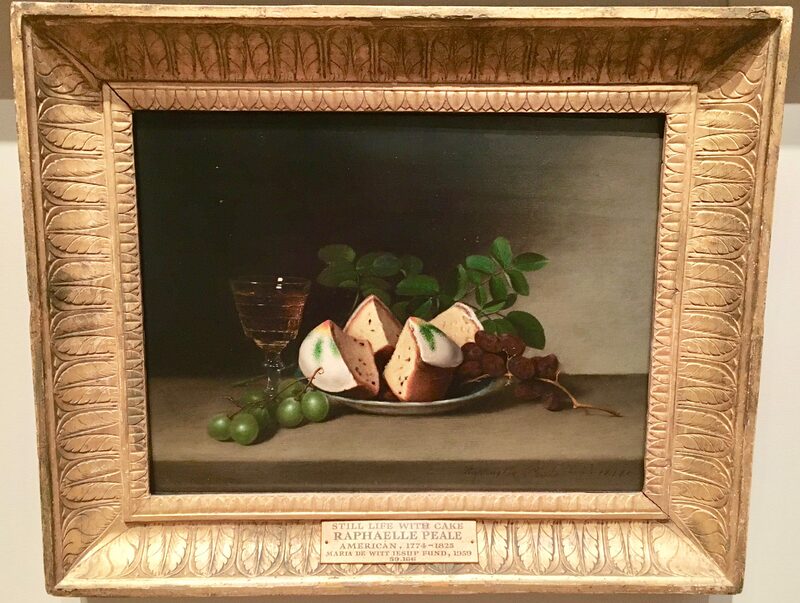 Peale’s tightly-grouped still lifes are often permeated with a delicate melancholy akin to that which characterized the life of the artist; he was an alcoholic who suffered the effects of arsenic and mercury poisoning caused by his work as a taxidermist in his father’s museum. His spare, essential style may have been influenced by the Spanish still lifes he studied in Mexico and by the works of Juan Sanchez Cotan, exhibited at the Pennsylvania Academy in 1818. Photographed in The Metropolitan Museum of Art in NYC.